GENEVA (AP) — FIFA Council member Sheikh Ahmad Al Fahad Al Sabah of Kuwait is resigning from his soccer roles under pressure from allegations in an American federal court that he bribed Asian officials. Sheikh Ahmad said Sunday in a statement he will withdraw from a May 8 election in Bahrain for the FIFA seat representing Asia, which he currently holds. “I do not want these allegations to create divisions or distract attention from the upcoming AFC (Asian Football Confederation) and FIFA Congresses,” said the Kuwaiti royal, who denies any wrongdoing. “Therefore, after careful consideration, I have decided it is in the best interests of FIFA and the AFC, for me to withdraw my candidacy for the FIFA Council and resign from my current football positions,” he said. The long-time Olympic Council of Asia president contacted the ethics panels of FIFA and the IOC after the allegations were made in Brooklyn federal courthouse on Thursday. FIFA audit committee member Richard Lai, an American citizen from Guam, pleaded guilty to wire fraud conspiracy charges related to taking around $1 million in bribes, including from Kuwaiti officials. The cash was to buy influence and help recruit other Asian soccer officials prepared to take bribes, Lai said in court. Sheikh Ahmad resigned his candidacy ahead of a FIFA panel deciding whether to remove him on ethical grounds. The FIFA Review Committee, which rules on the integrity of people seeking senior FIFA positions, has been studying the sheikh’s candidacy since the allegations emerged, The Associated Press reported on Saturday. The FIFA ethics committee is making a separate assessment of whether to provisionally suspend the sheikh, a long-time leader of Kuwait’s soccer federation who was elected to FIFA’s ruling committee in 2015. 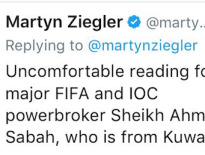 Resigning from his soccer positions does not necessarily put Sheikh Ahmad out of reach of FIFA ethics prosecutors and judges if any action was taken. In 2012, former FIFA presidential candidate Mohamed bin Hammam of Qatar was banned for life by the ethics committee days after he resigned. Bin Hammam was also clearly identified in Lai’s court hearing for having paid Lai a total of $100,000 in bribes to support the Qatari’s failed challenge to FIFA’s then-president Sepp Blatter in 2011. Bin Hammam was removed from that election contest in a Caribbean bribery case. Sheikh Ahmad has also contacted the IOC’s ethics commission about the allegations against him, the IOC said on Saturday. 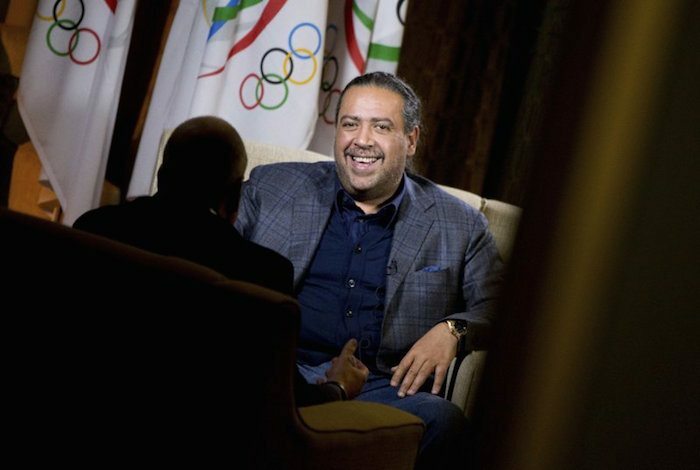 As president since 2012 of the global group of national Olympic bodies, known as ANOC, Sheikh Ahmad’s support has often been cited as key to winning Olympic election and hosting awards. The sheikh was widely credited for helping Thomas Bach win the IOC presidency in 2013. Although Sheikh Ahmad was not named in Department of Justice and court documents last week, he has become one of the most significant casualties of the sprawling U.S. federal investigation of bribery and corruption in international soccer revealed two years ago. The sheikh could be identified in a transcript of Lai’s court hearing which said “co-conspirator #2 was also the president of Olympic Council of Asia.” Sheikh Ahmad has been OCA president since 1991. Co-conspirator #3 was described as having a “high-ranking” role at OCA, and also linked to the Kuwait soccer federation. “I understood that the source of this money was ultimately Co-Conspirator #2 and on some occasion Co-Conspirator #3 told me to send him an email saying that I need funds so he could show the email to Co-Conspirator #2,” Lai said in court. Lai admitted that he agreed to help recruit other Asian officials that voted in FIFA elections who would help Kuwait’s interests. The Guam soccer federation leader since 2001, Lai pleaded guilty to wire fraud conspiracy charges and failing to disclose foreign bank accounts. He agreed to pay more than $1.1 million in forfeiture and penalties, and will be sentenced at a later date. The American federal investigation of corruption linked to FIFA has indicted or taken guilty pleas from more than 40 people and marketing agencies linked to soccer in the Americas since 2015. Lai’s case marked the first major step into Asia, and suggests other soccer officials potentially recruited by the Kuwait faction could be targeted. The Asian election for FIFA seats on May 8 in Manama, Bahrain, is the same day as a FIFA Council meeting which the sheik will not attend. The FIFA congress is held in the city three days later.